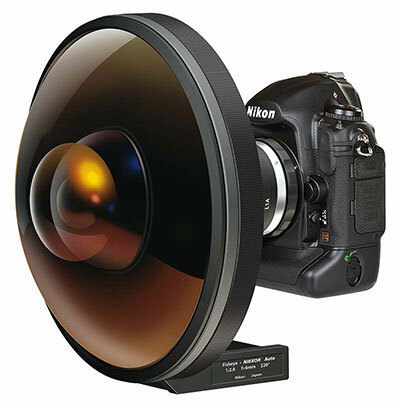 Brief: To create a 3/4 view of an incredible fisheye lens made by Nikon. Recreating an image of the lens with a modern Nikon SLR body attached. This incredibly rare 6mm f2.8 lens was recently sold for $34,020 on ebay! Low res snaps and reference images were supplied. Solution: Working from a small x-section detail showing the lens element layout, I created and rendered a 3d model. A supplied image of the Nikon SLR body was used to add to the modern camera and the details were added in Photoshop as part of the composite and finishing process.